Sub-varsity baseball teams vs Paschal, 6:00/8:00 PM. Softball vs Arlington Sam Houston, 6:00/7:30 PM. Trimble Tech has two parking areas with immediate access to the athletic facilities, the southwest side of the school between the school and the baseball field and the parking lot across College Street in the southeast corner of the school. Those attending the softball games and or the soccer games might be able to find parking south of the school on Dashwood street. All three of these areas are highlighted in yellow in the picture below. WARNING: For those who park on Dashwood and the field/lot south of the baseball field, during any games, you are parking at your own risk. Foul balls have been known to go that direction from the baseball field. 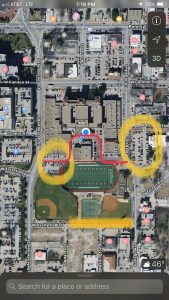 Trimble Tech and/or FWISD is not responsible for any damages to cars/trucks that are parked in these areas. Please do NOT parking in the fire lanes which, as in the picture, are marked by red line and marked as a no parking area. Tow trucks have picked up cars parked in the fire lane before. 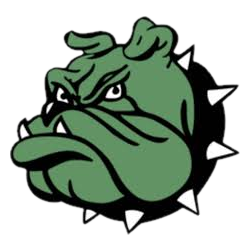 We hope everybody enjoys their visit to Trimble Tech and watching their loved ones participate in athletics, please plan accordingly for Friday and your parking needs. We will have a full house Friday and thus the reason for this post.